For small farmers, making a living from selling food is getting harder and harder. Time to hustle. Karen and Dennis Ramseyer started growing and selling pumpkins on their 5th generation Ohio potato farm in 2000. One thing led to another and soon they created corn mazes, hay rides, and began touring groups of school kids around the farm. 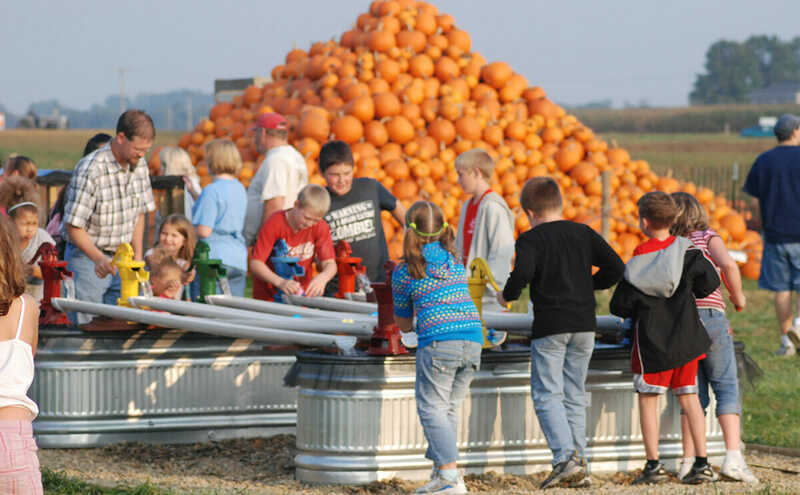 “One year,” recalls Karen Ramseyer, “we refurbished a combine and turned it into a slide.” Now, they add a new attraction every year, and employ a staff of 30 people every fall. 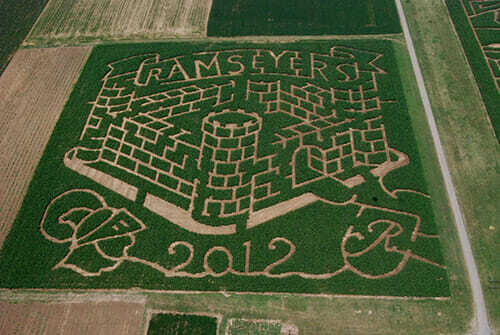 The bulk of the farm’s 20,000 annual visitors come through in September and October, but this mini farm-themed amusement park takes Ramseyer a good part of the year to plan and assemble, as they chart out the mazes using graph paper and hoe it by hand. But the hard work is worth it. The “agritainment” component now accounts for about a quarter of the farm’s income. This hasn’t always been the case. But the Ramseyer’s potato farming operation has shrunk from 1,200 acres to 700 acres over two generations, and with it, their ability to sell to big manufacturers. “There used to be dozens of smaller potato farms in Northeast Ohio, but we’re the last in the area,” says Ramseyer. “One by one, they’ve dropped out of the game.” Like many small farmers, the Ramseyers, have to make up for that lost income. They have just a few options. They can rely on off-farm jobs. Or they can hustle. And how small farmers make a living on the margins today says a lot about our evolving relationship with agriculture. The diminishing size and economic strength of the Ramseyer farm mirrors longstanding national trends of farm consolidation. According to the U.S. Department of Agriculture, the median farm operator household consistently incurs a net loss from farming activities even though 91 percent of American farms are classified as “small,” and 60 percent of these are “very small,” meaning they’re are generating less that $10,000 a year. As the bulk of our food is now grown on highly-industrialized operations, where a small number of consolidated operations turn a sizable profit. So farmers look for other ways their farms can make money for them, and those activities can take any number of forms. It can be selling food directly to consumers via farm stands, country stores, farmers’ markets and Community Supported Agriculture (CSA) boxes. Some farmer grow flowers or plants, while others create a steady stream of value-added products, which are often more shelf-stable, and cost more than raw ingredients. The list of possibilities range from jam and pickles to bath products, wool, seeds and decorative gifts. One goat farm in Pescadero, California, supplements their cheese operation with soap and a new line of goat milk paint. Another operation in Sandy, Oregon, sells logs inoculated with Shiitake mushroom spores online. Also popular these days are on-farm cafes, restaurants and dining rooms for special farm dinners, as are classes, tours, U-picks and venues for weddings and family reunions. Agritourism is also prevalent on small farms outside the U.S., where many small, sustainable operations have become tourist destinations. “Most farms are just trying to find that niche nobody else is doing so they can settle into it,” says Lynn F. Kime, extension associate at the Penn State Agricultural Alternatives Project. 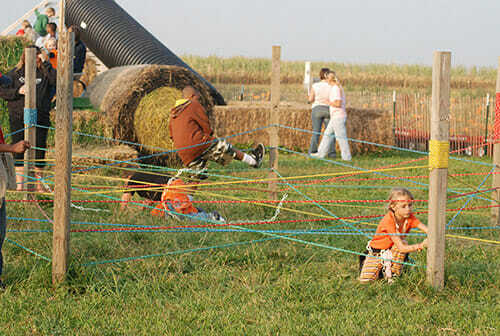 Kids at play at the Ramsayer's farm. Tearing around a corner on a go kart. 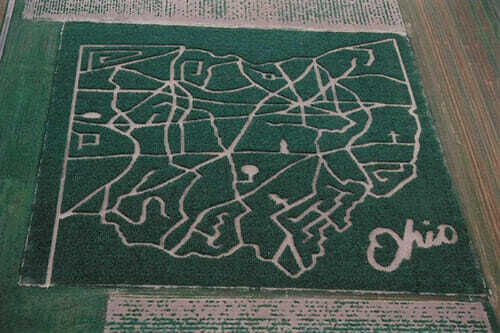 The corn mazes are charted out on a graph paper each year. 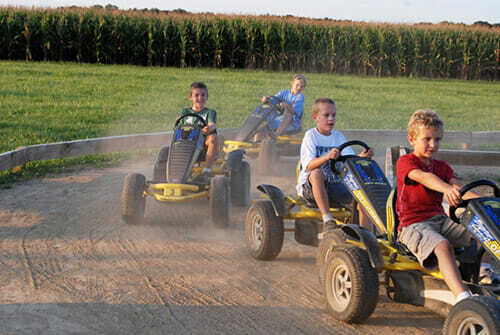 While the effort takes a good part of the year, visitors to the farm's attractions now make up a quarter of their income. And that might be what’s most interesting about this moment. On the one hand, small farms now mean much more to the non-farming population than they have in recent years; they provide a needed break from urban and suburban life and a source of education and connection with the natural world. On the other hand, they’re also often seen as a nostalgic backdrop, or a novel place to visit, get married, or dine. Just as our cultural obsession with animals ”“ on YouTube and elsewhere — coincides with a rapid decline in the number of actual animal species on the planet, much of the current cultural fascination with small farms (and our desire to visit them) is arising just when those very farms are at most risk of disappearing. Of course, farms that produce a narrow range of foods have only been common for the last century or so in the United States. And, on the bright side, this drive toward creative growth on small farms has resulted in farms that look a lot more like Old McDonald’s Farm than they have in the last century. In many cases, this is a shift away from bland, monoculture-style farming and toward more diversified farm ecosystems. Take Bechard Farm in Southwest Missouri. Surrounded on by a large commercial dairy operation on one side and a big hay producer on the other, Armand and Teddi Bechard (and their children) raise five kinds of pastured meat, sell eggs, raw milk and cream, make homemade bread, soap and a wide array of preserves. They also run an on-farm store where they offer all these products to their customers. Pastured animal products are a notoriously low-margin business (it takes much more time and labor to raise an animal outside the industrial model), so the value-added products are crucial piece of the business. In fact, they constitute a full 40 percent of the Bechards’ total sales. But that’s not the only reason they grow and make such a wide variety of goods. “Diverse is the way farms should be,” says Teddi Bechard. “We believe that God didn’t intend for farms to be a single operation. We weren’t made to have just rows and rows of chicken houses. The land and animals are healthier with diversity.” Plus, she adds, when you raise a variety of living things, there’s a natural cycle to the way the work takes shape throughout the year. “The sheep are lambing at one time of the year, and when we’re no longer busy with that, we’re busy with the chickens,” says Bechard. This drive toward diversity on farms is especially evident in the demand for grants the USDA is giving small farmers to take on value-added projects around the nation. The agency awarded 110 businesses with so-called “Value-Added Producer ” grants last year, but Lillian Solerno, the acting administrator for the USDA’s Rural Business-Cooperative Service agency, says they could have easily given away twice as many to deserving, interested businesses if they’d had the funds. Another bright side to all this hustling on small farms is the fact that it gives the next generation a much wider range of options when it comes to taking part in the family business. “Off-farm jobs would happen much less frequently if people could earn a living doing something they liked back on the farm,” says Charlie Touchette. And he should know. He runs an organization called the North American Farmers’ Direct Marketing Association, and runs a 100-acre “hobby farm” on the weekends. On Ramseyer Farm, Karen and Dennis’ triplets have been helping with the fall festivals since they were little. They’ve seen the operation take shape over the years, and Karen Ramseyer welcomes their suggestions for new ways to help it grow. *A previous version of the story stated that the Ramseyer farm used to be 1,200 acres and now is 700 acres. The family actually moved farms over the course of two generations, although always growing potatoes (among other things) in the region. We’ve clarified that sentence.